The onsite gym means you don't have to go looking for a place to work out. Interiors are airy, open spaces with a mid-century modern flair. Kick back and enjoy a movie in the private onsite theater. Sleek interior design stays true to the building's history, keeping original architectural elements intact. Brush up on your game at Miami Beach Golf Club, a 9 minute drive from the resort. American Airlines Arena is a 17 minute drive away. The resort is a 20 minute drive from Miami Seaquarium. Take a quick walk to the dining and shopping on Collins Avenue – you're in the middle of it. The shopping and dining at Lincoln Road is a 7 minute drive away. The Art Deco Historic District is a 5 minute drive away. The sleek, classic Art Deco Nassau Suite Hotel was built in 1936 and is registered as a National Historic Monument. 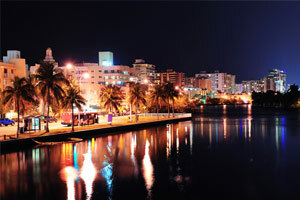 The resort is centrally located on Collins Avenue, in the heart of Miami Beach’s Art Deco District and staffers are multilingual. The complimentary continental breakfast is worth a stop before heading out for the day, complete with pastries, yogurt and fruit, plus coffee, juice and tea. The 24/7 concierge is your new best friend, offering insider tips on dining, shopping, clubs, best beach spots and more. And the resort staff is so on it, they’re two steps ahead, anticipating your every need. Feel like a work out? The well-equipped fitness center features a variety of exercise equipment including free weights and a stationary bike. After a few late nights out on the town, you may be feeling a quiet night in – reserve the private onsite movie theater and line up a double-feature. The suites have been renovated by well-known European architect Julien Bergier. The 584 square foot studios feature one king-size or two queen-size beds. And the 680 square foot one-bedroom condos feature a king-sized bed in the bedroom and a queen-sized pull-out sofa bed in the living room. All residences include a large living room, bathroom with a shower and bathtub. The hangout area is perfect, whether your group is more into movies or semi-pro at charades. Bedrooms feature walk-in closets – so there’s plenty of room for your going-out outfits. (Guests receive VIP access to nearby night clubs.) The fully equipped kitchens have everything you need to work your culinary magic, and it’s just an eight-minute drive to Publix or a four-minute walk to Art Deco Supermarket for grocery runs. Daily housekeeping frees up more of your day for the fun stuff, like lounging on the beach or checking out local boutiques and galleries. You’re just five minutes from the beach, where you’ll likely spend much of your days. The resort provides beach chairs and towels free of charge. When you’re ready to venture beyond the surf and sand, you’re within walking distance of the Miami Beach Convention Center, several art museums and the Jackie Gleason Theatre. For dining and shopping, check out the options along Lincoln Road’s pedestrian zone. This mile-long outdoor shopping venue features national names like Forever 21 and Sketchers – and local boutiques like Base for limited-edition gear or Books & Books for your next great beach read. Starbucks fans, rejoice. You’ll find three on Lincoln Road. - The name on the credit card used at check-in to pay for incidentals must be the primary name on the guestroom reservation.